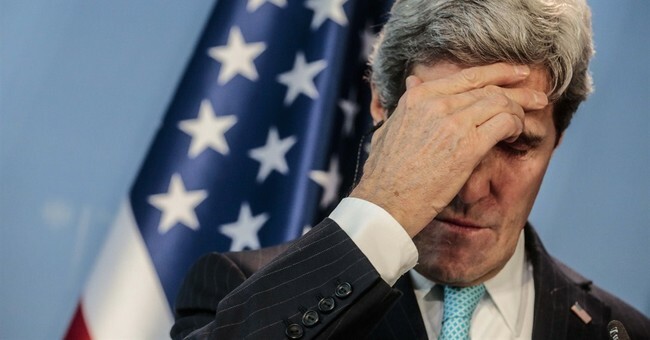 This reality was plain as day when the initial deal was first struck after John Kerry accidentally blurted out an idea that went from being instantly walked back by the Obama administration to official Obama administration policy in a matter of hours. Assad and Putin recognized the stumble as an opportunity and seized it, and President Obama -- desperate for any escape hatch from his "red line" ultimatum -- decided to play along, which only came at the price of being humiliated on the world stage. Then came the news in late December that Syria was far behind schedule in meeting its initial deadline to turn over its illegal chemical weapons cache, per the "breakthrough" agreement. Now, in a significant scoop from the Daily Beast's Josh Rogin, Sec. Kerry is reportedly admitting behind the scenes that the administration's entire Syria policy has failed in discussions with members of Congress. Ladies and gentlemen, I give you "smart power:"
In a closed-door meeting, two senators say, the Secretary of State admitted to them that he no longer believes the administration’s approach to the crisis in Syria is working. Peace talks have failed, he conceded, and now it's time to arm the moderate opposition—before local al Qaeda fighters try to attack the United States. Secretary of State John Kerry has lost faith in his own administration’s Syria policy, he told fifteen U.S. Congressmen in a private, off-the-record meeting, according to two of the senators who were in the room. Kerry also said he believes the regime of Bashar al Assad is failing to uphold its promise to give up its chemical weapons according to schedule; that the Russians are not being helpful in solving the Syrian civil war; and that the Geneva 2 peace talks that he helped organize are not succeeding. But according to the senators, Kerry now wants to arm Syria's rebels—in part, to block the local al Qaeda affiliates who have designs on attacking the U.S.
Kerry’s private remarks were a stark departure from the public message he and other top Obama administration officials repeatedly have given in public. Shortly after the meeting ended, Sens. Graham and John McCain described the meeting to The Daily Beast, The Washington Post, and Bloomberg View. Given newly-released intelligence on the growing al Qaeda presence in Syria, as well as shocking new evidence of Syrian human rights atrocities, the senators said they agreed with Kerry that the time had come for the United States to drastically alter its approach to the Syrian civil war....Kerry confirmed new testimony by Director of National Intelligence James Clapper, who told Congress last week that al Qaedas affiliates in Syria “have aspirations for attacks on the homeland.” ... McCain and Graham also said they share Kerry’s assessment that the U.S. must take steps to address the growing al Qaeda presence in Syria, which Clapper said now amounts to over 26,000 extremists on Syrian soil...The lawmakers also said that newly released evidence showing the torture and apparent starvation of as many as 11,000 civilians by the Syrian government might be enough to persuade the White House to change course in Syria, as Kerry said he wanted.